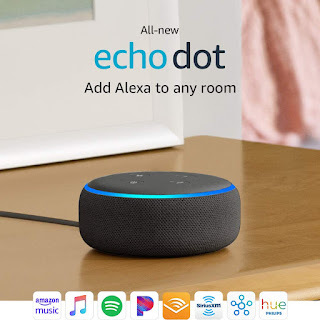 Check out this *BEST PRICE* All-new Echo Dot (3rd Gen) ONLY $29.99 (Retail $49.99)...great Teen Gift. •Echo Dot is our most popular voice-controlled speaker, now with improved sound and a new design. •Ask Alexa to play music, answer questions, read the news, check the weather, set alarms, control compatible smart home devices, and more. •Stream songs from Amazon Music, Apple Music, Spotify, Pandora, SiriusXM, and others through the improved speaker for richer and louder sound. •Call and message almost anyone hands-free. Instantly drop in on other rooms in your home or make an announcement to every room with a compatible Echo device. •Can hear you from across the room. And with compatible Echo devices in different rooms, you can fill your whole home with music. •Pair with a second Echo Dot (3rd gen) for stereo sound, or connect to your own speakers over Bluetooth or with a 3.5 mm audio cable. •Use your voice to turn on lights, adjust thermostats, lock doors, find TV shows, and more with compatible connected devices.